A Demon Beast Digimon that is considered the king of vampire Digimon. 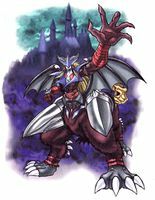 It has kept a castle in the Dark Area since ancient times, and it boasts of such power that even the Seven Great Demon Lords cannot interfere with it. 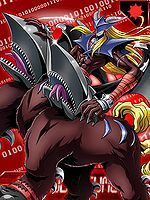 It has a gentlemanly demeanor, and because of the "Charm" effect within the voice Grand Dracumon exudes, it has tales that can lead any Angel Digimon who comes to subdue it into falling down. It is told that it possesses an undying body, and although it is said that it is connected to the details of how the Dark Area came to be within the Digital World, or that it knows the truth of the mysterious evolution, "Death-X", because it's difficult just to struggle your way to the castle, you'd have to say that questioning it about these mysteries would be extremely arduous. 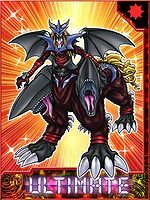 Its Special Moves are instantly transforming all of the opponents into ice crystals (Crystal Revolution), and an evil eye that imprisons within darkness the hearts of the opponents that gaze at it (Eye of the Gorgon). This profile matches its partner in the Digimon Reference Book, except for the following highlighted differences. Title: 「吸血鬼の王」 — "Vampire King"
「夜の支配者」 — "Ruler of the Night"
| Dracu is short for Count Dracula (「カウントドラクラ」 Kaunto Dorakura), the legendary lord of vampires. 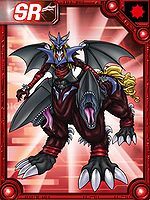 Crystal Revolution  クリスタルレボリューション Kurisutaru Reboryūshon Changes its enemies into crystalline ice. Eye of the Gorgon  アイオブザゴーゴン Ai obu za Gōgon Gazes into its opponent's heart, enslaving them to the darkness within. 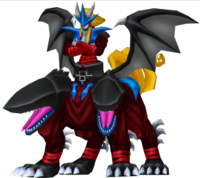 Grand Dracumon is the boss of the Kowloon Co. On the Union Mission "Deadly Merchant", you are given the choice to either pay 100,000 bits or fight him. 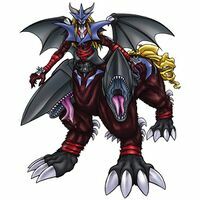 Grand Dracumon is available as a Digimon Medal. Can evolve from Matadrmon or Scorpiomon. 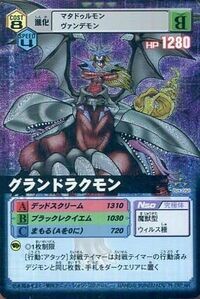 Can also be obtained by Jogressing Angewomon with Matadrmon. This Vampire King has felled countless angels from heaven! 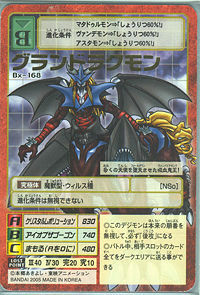 ↑ 1.0 1.1 It can be noted that the following attack is also used by Gulfmon and is likely misprint on the card. This page was last modified on 21 March 2019, at 17:43.